In its second batch of approvals from the 2017-2019 allocations, the Global Fund Board has authorized funding of $1.25 billion for 32 grants to 15 countries. Included in this total were five matching funds requests valued at $22.9 million. The Grant Approvals Committee says there is a risk that the Democratic Republic of Congo will not be able to meet its 2017-2019 co-financing requirements. Nevertheless, the GAC recommended approval of three HIV and three malaria grants to the DRC. To mitigate the risk, the Secretariat will step up its monitoring of the DRC’s progress towards meeting its co-financing commitment. The GAC also expressed concern about a gap in the DRC’s funding for mass distribution of long-lasting insecticidal bed nets. The “mandate” of the Regional Platforms for Communication and Coordination has been renewed under the Communication, Rights and Gender Strategic Initiative, the successor program to the Special Initiative that was in place from 2014 to 2016. Five of the six regional platforms will be hosted by the same organizations as previously. The platforms will support communities to access technical assistance and to engage in all aspects of grant processes. The Technical Review Panel’s report on 2017-2019 funding requests submitted in Windows 1 and 2 includes observations on a number of topics. This article focuses on what the TRP said concerning the importance of reaching key and other high-prevalence populations. It also provides a “table of contents” for Part Two of the report (technical observations). This article contains several brief extracts from Part Two of the report of the Technical Review Panel on the funding requests it reviewed in Windows 1 and 2 of the 2017-2019 allocation period. Although there have been some delays, steady progress has been made in implementing activities related to the second objective of the Global Fund Strategy 2017-2022 (building resilient and sustainable systems for health). Some challenges have been encountered, especially in operationalizing strategic initiatives. Work to implement the third objective of the Global Fund Strategy 2017-2022 – Promote and protect human rights and gender equality – is progressing well, although there have been what the Fund calls “minor issues and delays.” These issues can be attributed in part to a lack of resources and insufficient internal capacity on human rights issues. An audit conducted by the Office of the Inspector General reveals solid progress in implementing HIV, TB, malaria and HSS grants to Ethiopia – but also inefficiencies in grant management, absorption, quality of services, and procurement and the supply chain. The audit covered the period from July 2015 to March 2017. Despite functioning in a challenging operating environment, Global Fund grants have helped Mali achieve significant progress against the three diseases, according to an audit conducted by the Office of the Inspector General. However, there are problems with drug expiries and stockouts, delays in the supply chain, and delays in, or non-provision of, testing and treatment. On 13-14 November, a consultation took place in Minsk, Belarus on the terms of reference for next round of multi-country HIV projects for Eastern Europe and Central Asia financed by the Global Fund. As part of catalytic funding for 2017-2019, $13 million has been set aside to promote the sustainability of HIV services for key populations in the EECA region. The Secretariat is expected to issue a request for proposals in mid-December. Board members have expressed some dissatisfaction with the current process for selecting the Board chair and vice-chair. A paper describing options was prepared for the Board meeting in Geneva on 14-15 November. The Board is expected to decide at its next meeting in May 2018 whether changes are required. Mali has made significant progress in the fight against the three diseases despite facing a challenging operating environment. The quality of program data and services has improved. Financial systems and processes generally function effectively. However, there are problems with drug expiries and stock-outs; delays in the supply chain; data inconsistencies; non-adherence to treatment guidelines; and delays or non-provision of testing and treatment. These are the main conclusions of an audit of Global Fund grants to Mali conducted by the Office of the Inspector General (OIG). A report on the audit was released on 20 November. The audit covered the period January 2016 to June 2017. Mali, a low-income country with a population of 17.6 million, is one of the 25 poorest countries in the world. Due to ongoing civil wars in the northern regions, Mali is designated as a challenging operating environment by the Global Fund, and it operates under the Fund’s Additional Safeguard Policy. There are four active grants to Mali: an HIV grant managed by the UNDP; another HIV grant managed by Plan International; a malaria grant for which the principal recipient (PR) is Populations Services International (PSI); and a TB grant, managed by Catholic Relief Services. Half of the budgets of the grants goes to procurement of medicines. The table lists the three areas assessed in the audit, and the OIG’s ratings and summary comments for each area. AREA 1: Effectiveness of the supply chain internal control systems and assurance mechanisms to deliver and account for medicines. OIG comments: The roll-out of automated inventory and logistics information systems, as well as supply and distribution guidelines, have improved the supply chain of drugs. However, recurring stock-outs and data inaccuracies continue to exist, contributing to emergency orders and testing and treatment disruptions. Useful information generated by the automated systems needs to be analyzed and used effectively for pre-empting supply chain issues. AREA 2: Effectiveness of the program supervision and other internal controls in providing accurate program data and appropriate services to the patients. OIG comments: The assurance and supervision mechanisms have successfully identified the issues of material inconsistences in primary data records and registers, health facilities and treatment center reports, and national disease statistics. However, due to weak follow-up of supervision findings, there is limited effectiveness in rectifying the identified weaknesses. The lack of national codification of HIV patients adds to the risk of data inaccuracies. Treatment facilities for both malaria and HIV exist at all levels, while treatment protocols and guidelines have also been developed and are widely disseminated. However, stock-outs of essential drugs or equipment breakdowns have also resulted in instances of non-adherence to treatment protocols, treatment delays or failure to treat. AREA 3: Design of financial controls and assurances in identifying and treating financial issues. OIG comments: Due to the change in grant implementation arrangements and the introduction of additional safeguards after 2010, financial management and procurement processes and controls for both grant recipients are generally effective, with limited operational financial issues identified during the audit, or reported through other assurance arrangements. Mali has made good progress in reducing disease burdens, the OIG said. Malaria deaths decreased from 20 per 100,000 in 2010 to less than 10 per 100,000 in 2015. Antiretroviral (ARV) treatment coverage increased from 40% in 2014 to 58% in 2016. Measures are underway to improve the supply chain and the quality of data and services, the OIG stated. New information systems have improved the quality and timeliness of data from health facilities and from the regions, with some gains experienced in reducing stock-outs, drug expiries, treatment disruptions and compliance with treatment guidelines. Sufficient storage capacity, cleanliness and good distribution arrangements generally exist in the supply chain, the OIG said. Also, assurance mechanisms have been generally effective in identifying challenges in programmatic data and quality of services. further improvements are needed in the supply chain. Material data deficiencies were identified throughout the reporting chain, the audit found, including at the national data level, and in primary health care record and monthly reports from health facilities. Due to the lack of systematic follow-up, the OIG said, supervision visits have limited effectiveness in resolving the identified data issues. The lack of (a) quality assurance on data submissions and (b) a national codification of HIV patients also contributes to data issues. The OIG said that it had observed cases of malaria treatment without proper testing, cases of HIV treatment without CD4 or viral load testing, and instances of failure to provide treatment because testing could not be performed. Stock-outs of essential health commodities and breakdowns of testing equipment contribute to these gaps, the OIG stated. The auditors found testing and treatment gaps for both the malaria and HIV programs. For example, in the health facility in Waferma region, 161 cases were treated with artemisinin combination therapy without rapid diagnosis tests or microscopy in February and March 2017. In a health facility in Kolebougou region, on the other hand, patients with fever were not tested or treated. For HIV, patients from a main hospital which covers 5% of national treatment, and other care centers outside Bamako, could not carry out the CD4 and viral load tests required by the treatment protocol. Furthermore, weaknesses were found in the patient referral system. For example, patients were found to have been referred to the main hospitals, particularly in complicated and emergency cases, with a simple referral letter which did not include relevant and comprehensive patient history. National quantification and forecasting for HIV drugs should be more systematic, and should include regular meetings with all stakeholders, the OIG stated. 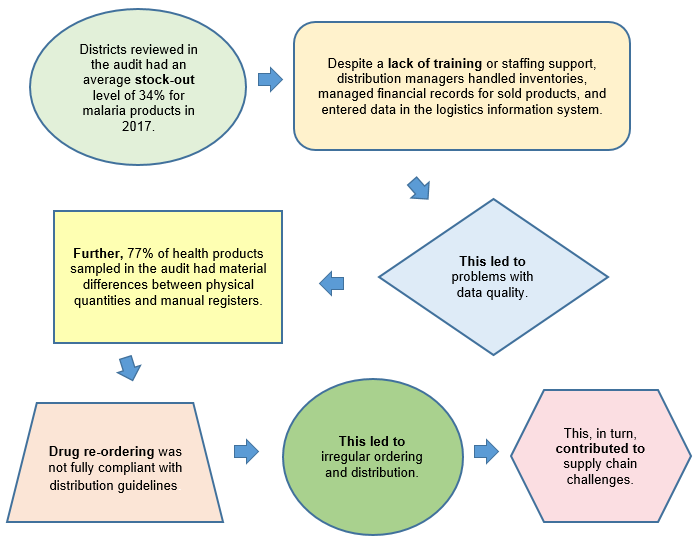 “This is necessary to avoid emergency orders of antiretroviral drugs, as noted in 2017, and to include supplies from partners like UNICEF.” Furthermore, the OIG said, quantification and inventory management should include all levels, not just the central warehouses, to avoid the risk of health commodity over-stocking or over-budgeting. An OIG audit of the Mali portfolio started in 2010. However, due to extensive financial irregularities, the audit was canceled and replaced by an investigation. The investigation identified banking fraud, misappropriation of funds, expenditure fraud, procurement irregularities and a lack of oversight. The OIG stated that the issues were largely attributable to weaknesses in the financial management capacities of the national disease programs, which were serving as PRs for the grants. Subsequently, new PRs were engaged, with the national programs continuing to implement the health services while functioning as sub-recipients (SRs). The Global Fund also instituted mitigation measures, such as a zero-cash policy, at the SR level. This has subsequently evolved into low cash use by SRs, the OIG said; under these arrangements, the PRs make most of the payments to suppliers. GFO provided extensive coverage of these developments (see, for example, here, here and here).